I think I’ve lost my charm, I got my first ever rejection. Not in life (heavens no, I’m an expert there) but as a daring documenter of little bikes. Maybe my approach was wrong. I noticed a woman wheeling a white Family Star along the footpath on the city fringe. The bike looked familiar and she sort of did too, I wondered if she was someone I’d posted in the past, so I glided up beside her and politely asked if I’d photographed her bike before, which I can see now could seem a bit weird. She said I hadn’t in a wary tone, I falteringly tried to explain my mission, sensing that she wasn’t going to play, so I gave her an out by asking if she had time for me to take a photo. She gratefully accepted the get-out-of-jail-free card by saying she was in fact running late (even though she was walking not riding, and she didn’t appear to have a flat). So that was that. 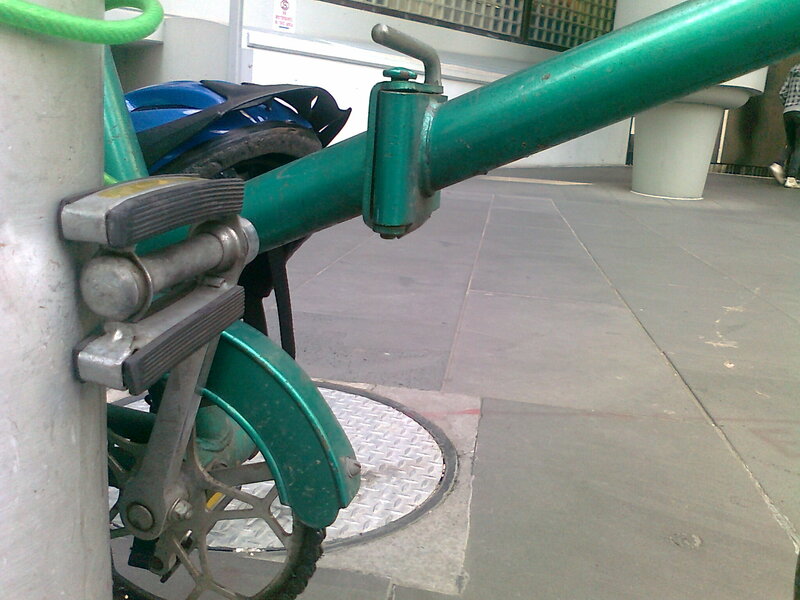 I’ll have to stick to riderless bikes like this one which I snapped in Swanston Street last week. I can’t pick what it is. Any ideas? And how’s this for a small world of little bike minded people: I spied this bike as I was about to go into a book launch, then I spied the stylish couple who I recently featured in Curses and glory sitting near by. I went to say hello and it turned out they were going to the same launch, not just any launch, but a niche event known to too few: the launch of the annual new writing anthology, Visible Ink (check it out here if you’re interested writerly sort of things). Synchronicity. PS. If the rider of this little green beauty is reading this, please accept my apology for the delay in posting your bike. I broke the promise on the calling-card that says it will be up in a day or two. I have just resurrected Penny The Peugeot (my NS22 folder) after a bit of a winter haitus – I had almost forgotten how much fun she was! I saw some pics of me riding her and I have to say that with my 6 foot frame it does look a bit like a clown bike!! Anyways, if you happen to see out and about on or with Penny I will be happy to stop and have a chat and a photo! Hooray, Penny is on the road again. Gotta love the clown bike. even smaller world – art bikes and literature – the stuff of life. 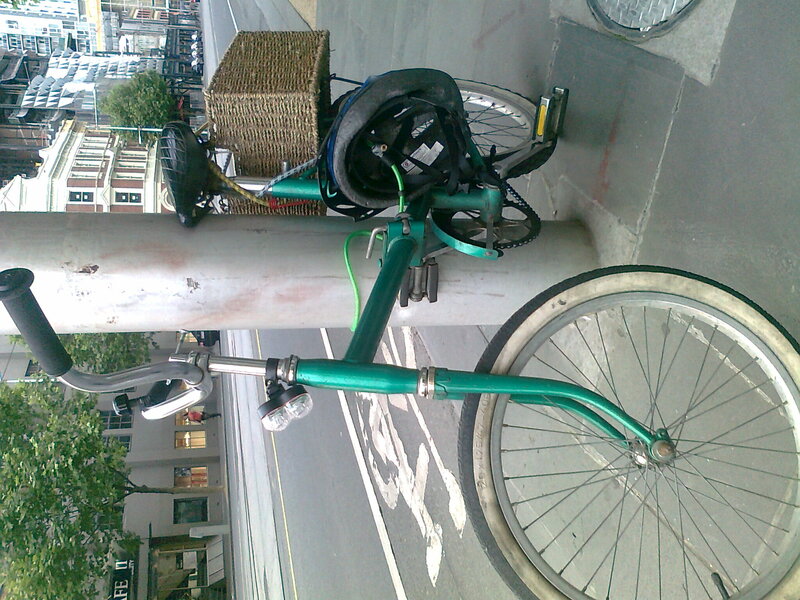 The Swanston Street bike looks like my Royce Union Folder that is made in Germany. oo thanks anonymous, another piece of the puzzle. Will stash that bit of info in my memory banks for future spotting reference.